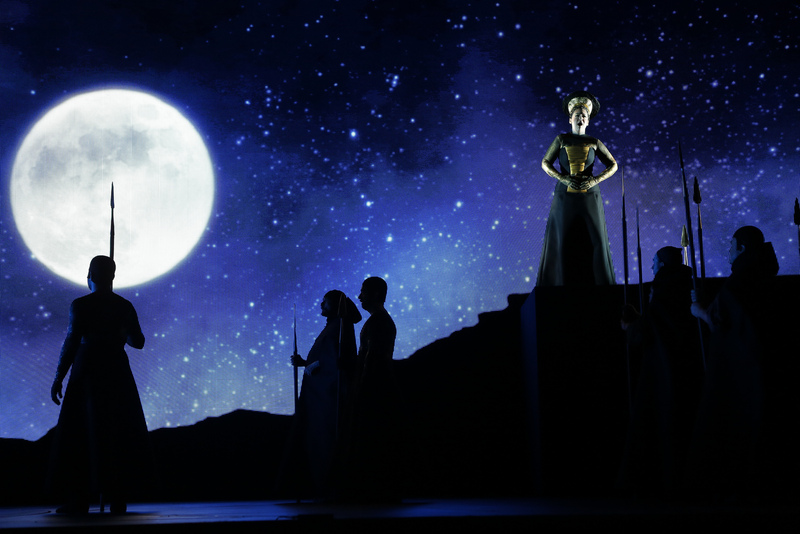 In April 2013, the New York City Opera returned to the New York City Center where the company made its debut in 1944. 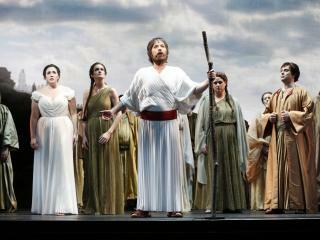 One of the titles that was performed during this season was Rossini's 1818 azione tragico-sacra "Mosè in Egitto". 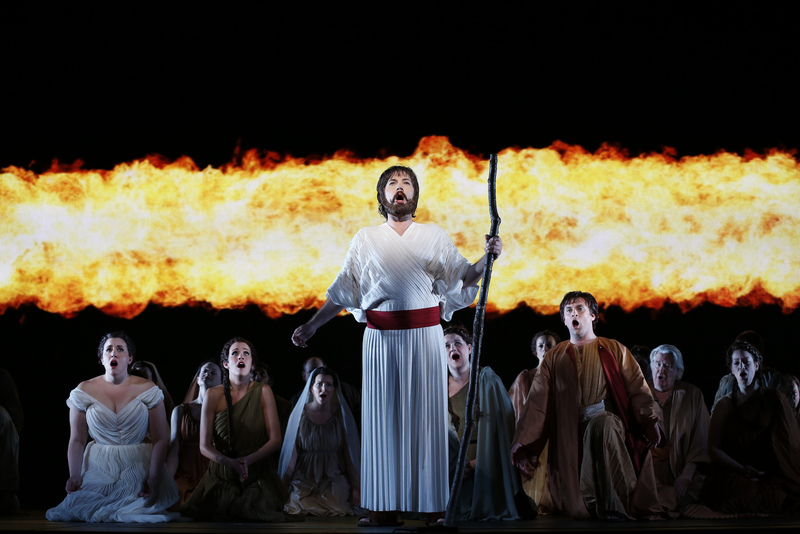 With a very clever and fluent staging by Michael Counts, using video images and projections that gave the atmosphere of the dessert, the cave, the Red Sea and the temples in Egypt, Rossini's lesser-known opera was brought to life in a way that made justice to the Biblical story. Apart from the well-known plot of the conflict between Moses and the Pharaoh to let the Hebrews leave Egypt, there is the love story of Osiride, son of the Pharaoh and Elcia, a Jewish girl. 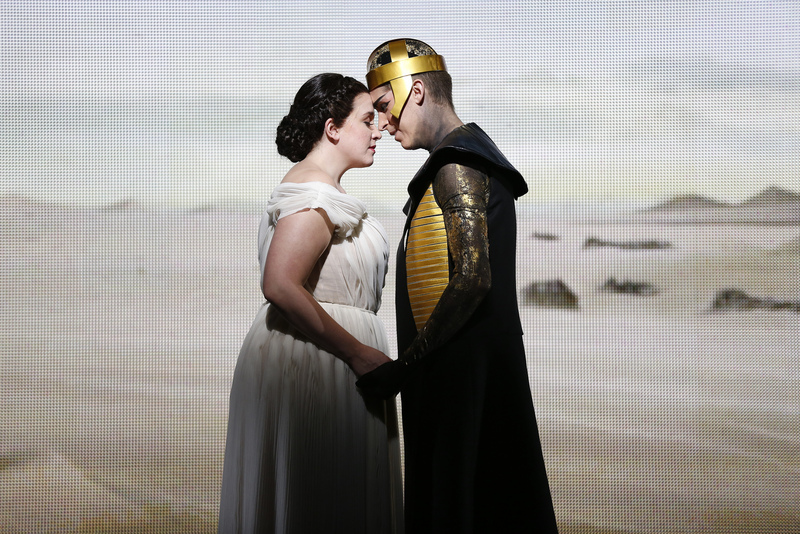 In fact, there were times where the love story was stronger than the Biblical one and that was partly because of the excellent musical performances of tenor Randall Bills and Osiride and soprano Siân Davies as Elcia. Bills has a very pleasant, lyric voice that is equally brilliant in his top notes as in his middle register and low notes. His coloratura is neat, he has wonderful legato and a full knowledge of the Rossini style. Among the cast, he and all the Egyptians were asked to act with a momevent that reminded us a little of that which Robert Wilson uses in his stagings: with very stylized arm momements and slow motions action. The Hebrews, on the contrary, moved less theatrical. His duets with Davies' Elcia "Non e ver che stringa il cielo" and "Ah! Se puoi cosí lasciarmi" in Act II was one of the highlights of the performance, specially for the blending of their voices and the vivid tempo that Maestro Ogren provided for his singers. Siân Davies was an amazing Elcia, singing with a bright, big voice, elegant phrasing and intensity. She was specially touching in her aria "Porgi la destra amata". The third member of the cast that gave a very imposing performance was soprano Keri Alkema as Amaltea. She has a big, beautiful soprano voice that carries over the orchestra without effort and a comanding stage presence. She was equally powerful in her aria as in the quartet of the second act "Mi manca la voce". 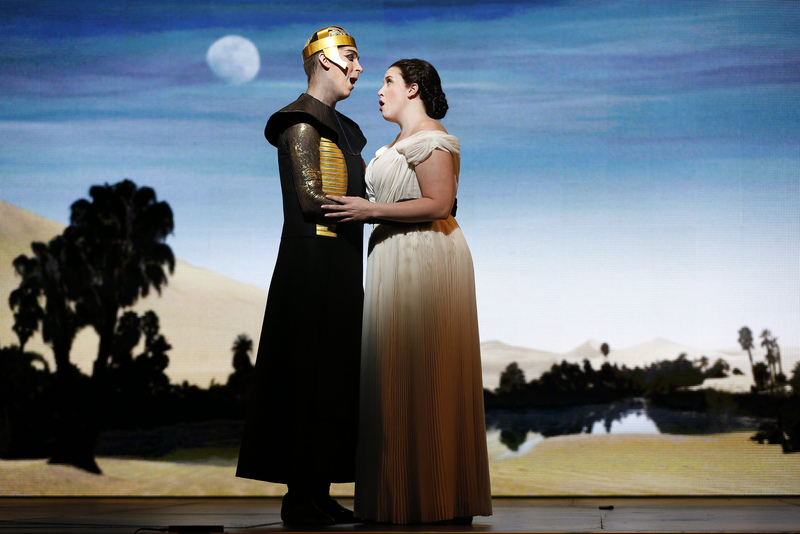 Bass-baritone Wayne Tigges as the Pharaoh sang with a strong, dusky tone and with a very muscular sound. His aria "Cade dal ciglio il velo" was well sung, though it needed a bit more of nuances. Bass-baritone David Cushing sang Mosè with a rather obscure tone that sound much better in his middle register. His acting was a bit stiff, not showing the desperation of the character but rose to the occasion in the famous prayer of Act III "Dal tuo stellato soglio". Visually speaking, the separation of the Red Sea was stunning. Tenor Aldo Caputo was a strong Aronne, singing with panache and good squillo. Tenor Zachary Finkelstein was a frightening Mambre, looking like one of the Blue Man Group but sounding quite well. 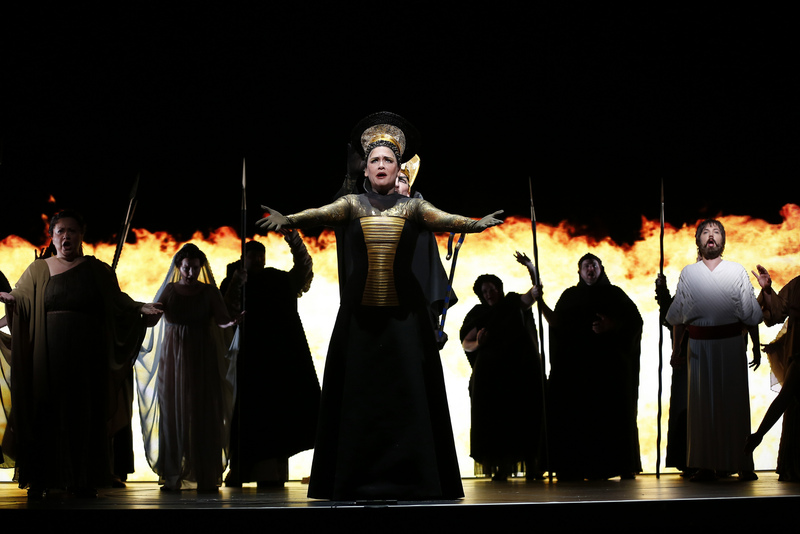 Kudos to mezzosoprano Emily Righter as Amenofi, whose voice sounded gorgeous in this short role. Conductor Jayce Ogren did a great job with the balance between the singers and the orchestra, bringing the grandiosity of the score to life with vibrant tempi and beautiful colors in the sound. 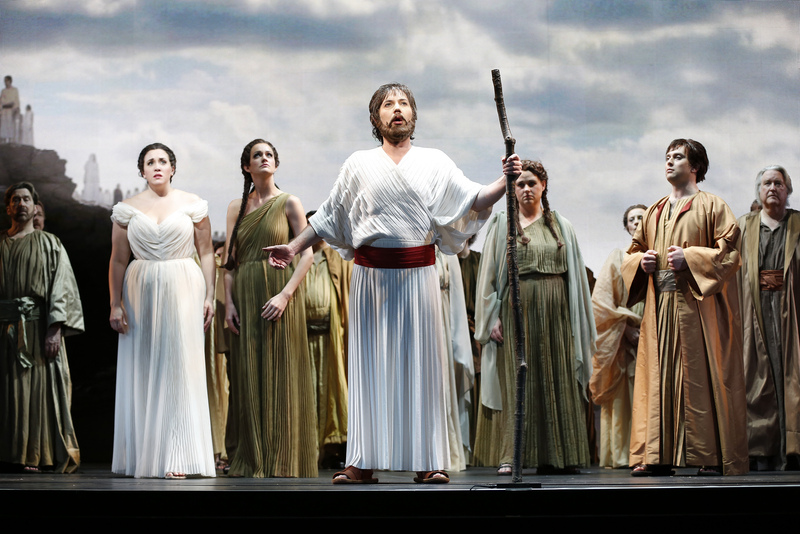 The chorus of the New York City Opera deserves also a praise, not only for their vocal performance but also for their commitment to the acting and the whole scenic design, which also depended on their involvement as extras and different characters. It was an amazing experience musically speaking and it was enhanced also by Counts direction and production design. In two hours and a half, the audience was transported to Egypt, to the dessert (where the characters literally walked while the landscape moved with them as they passed by), we entered the secret cave of Elcia and Osiride, we witnessed the division of the Red Sea and the peaceful ending with a sky full of stars that reflected the sublimity of what had just happened in the Biblical episode. It was a great way to listen Rossini's "Mosè in Egitto" and understand its important within the Rossini catalogue.